US emo rockers Taking Back Sunday have announced five UK dates for May 2011. Twelve years after forming - aptly enough - in horror story-famed Amityville in Long Island, Eddie Reyes and his band are returning to the UK and some of its best venues. What's more, they'll be touring with the (near) original line-up of Reyes, Adam Lazzara, John Nolan, Shaun Cooper and Mark O'Connell - the band members of around a decade ago and the breakthrough 'Tell All Your Friends' album. 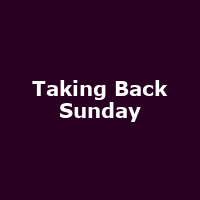 There'll be plenty of new material on show too with the recently recorded fifth studio album, the self-titled Taking Back Sunday, adding to an extensive back catalogue. The five-piece begin at the UEA in Norwich on Monday 9th May, playing Birmingham's O2 Academy the next night. Then it's the Southampton Guildhall (12th), Manchester Academy (Friday 13th), Nottingham's Rock City (14th), Barrowlands in Glasgow (16th), the O2 Academy in Liverpool (17th) and The Pavilion, Bath (18th) before the closing date on Friday 20th May at London's Roundhouse. Each venue promises a great atmosphere and plenty of opportunity to rock out, rail against the system and drink some confessional cider before getting picked up by your Dad. Tickets go on sale Friday 11th March at 9AM, costing £16.50 (£17.50 for London). The dates will be in high demand, so you'll need to be quick.